If I had a dollar for every kid who has come into my shop to rent skis wearing a thick pair of wet cotton tube socks, I would be a rich man. Ski socks don’t matter. Or do they? Here are a few thoughts on what ski socks to buy for every ski occasion. On a ski vacation and renting ski equipment? This is one of the few times I will recommend a thicker sock. Definitely not cotton though. Stick with wool, which is my preference for both comfort and their natural anti-microbial characteristics. If you are allergic or have a strong aversion to wool, go with a synthetic. Rental boots tend to fit on the large side, so a mid-weight will take up some slop, have some padding for your shins to reduce the dreaded shin bang, and provide some extra warmth. Remember that warm ski boots depend on good circulation and being DRY. This applies to having both dry ski boot liners and dry ski socks. Buying new Boots? Go thin. Pick your fabric of choice. My preference is merino wool. Thin socks will give the most room in your new boots, which should fit tightly. Trying on new ski boots with thick socks will give you a false sense of the size. Odds are you will end up in a boot that is too big – a costly mistake! Your ski boots have a few days on them? Experiment with progressively thicker socks until you find the pair that works the best. 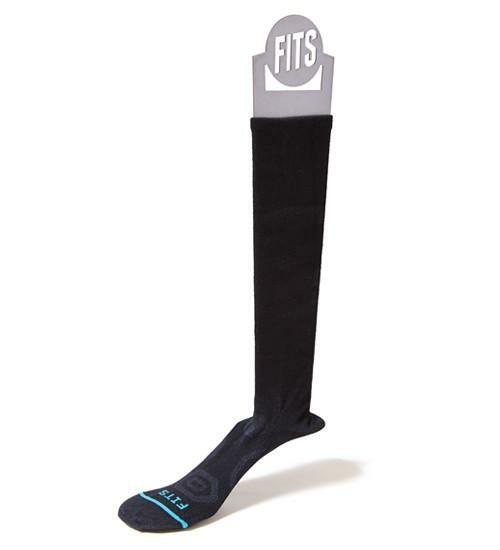 Ski socks come in a variety of thicknesses from ultra lightweight, to lightweight, to midweight. Feel the thickness of the socks at the foot, and you will notice the subtle differences in thickness. Some will have more padding on the shin, others none at all. If your boots still feel sloppy even with the thickest socks, it might be time for new boots. Want to feel like superman? Try some compression ski socks. Like the socks used to aid in medical rehabilitation, compression socks vary how much they squeeze your ankles, mid calf, and calf. This helps pump blood out of the legs and back to the heart, slowing fatigue and aiding in recovery. It’s not a gimmick and is well worth the price of admission. They work so well that they were declared illegal by the cycling governing body, the UCI, for use in the Tour de France and other races.